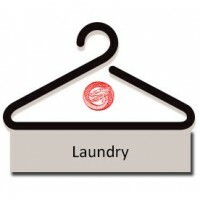 The Chinese Laundry Co are Edinburgh dry cleaners situated in Grange Loan who offer a unique and personal dry cleaning & laundry service. We can pick up and deliver to your office or home via our convenient Day and Night Runs, or you can just visit our local and friendly premises. Online ordering is now available to customers living or working in Edinburgh and Midlothian. Customers based in all other areas should use our Agent services. Our pick-up and delivery dry cleaning & laundry service covers a wide area of Edinburgh, Central Scotland, Glasgow, the Borders and East Lothian. While our client-base includes a number of high profile commercial and government-related organisations. As such, our service has to be of the highest quality. Find out more about how to book a convenient pick-up or to enquire about our dry cleaning & laundry services that ensure your garments and other materials are kept as good as new by calling us on 0845 543 8426. One x 2 Piece Dress Suit..
One x 2 Piece Suit..